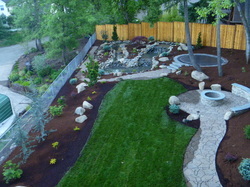 Graham Landscape and Design LLC designs, installs, and maintains residential and commercial landscapes in Eugene Oregon. 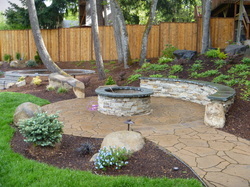 Pictured to the right is a complete backyard landscape designed and installed by Graham Landscape and Design LLC in Eugene Oregon. The Problem: This homeowner in Eugene Oregon entertains family, friends, and neighbors on a regular basis. They purchased the home of their dreams, but were not sure where to start with landscaping plans for this new home to them. They have young children at home and a couple of dogs, so the landscape had to work for entertaining and for their family romping around in the landscape. Design issues such as grade changes, utility locations, funky angles in this residential landscape posed enough challenges that these homeowners decided to hire Graham Landscape and Design LLC, a professional landscape design build company, to draw up plans and install a landscape to match the scale of their newly purchased home. The Solution: Graham Landscape and Design LLC created a multi-faceted landscape design to complement their beautiful newly purchased home. We brought in some our landscape equipment to efficiently remove portions of their existing landscape and to import new materials. Our excavation equipment and skilled operators can make quick work of transforming a landscape, we do not subcontract any portion of this type of work, it is all handled "in-house". 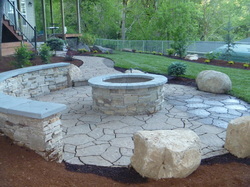 We chose materials for the walkways, seat wall, waterfeature, fire pit and more with input from the homeowner. These were and are great clients to work for. They have trusted us to let our landscape imaginations run wild (and we still provide weekly yard care for this newly installed landscape). We decided to "sink" their trampoline into the ground so there is no danger of falling off it for their kids. 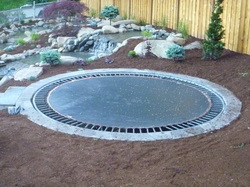 We accomplish this unique feature by excavating and hauling about 50 yards of soil, installing a circular retaining wall, establish the correct grade for the surface of the trampoline, and installing drainage underneath it. The result is that the kids now hop right on to the trampoline and hop right off, no climbing up or falling off of it. Check out our Awards and Recognition page to catch a glimpse of the Register Guard article on this backyard oasis. Want to see more Eugene Or landscapes? 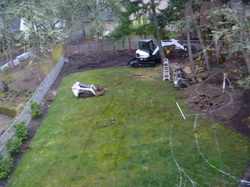 Check out this Eugene front yard landscape.